On the penultimate episode of Oprah Winfrey‘s beloved television show, aired today, actor Tom Hanks tells the TV icon in a video tribute: “Your show has turned surprise into an art form.” Over the course of her 25-year-old show, Oprah — who will depart on May 25 to run her new cable network OWN full-time — has gifted cars to her entire studio audience, introduced stars to their biggest fans, and reunited Rwandan refugees. She likes surprising her celebrity guests, too: her no-holds-barred interview with James Frey contributed, in its own way, to establishing the author’s rebel-artist persona. 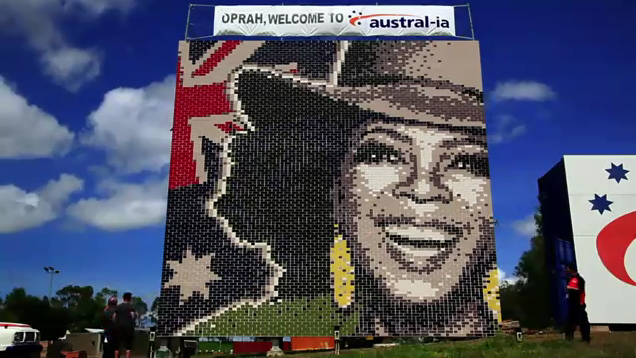 But even Oprah’s most avid followers may not know that while she herself is an artist of surprise, she is also the occasional muse for visual artists and a frequent patron of art institutions. In 2010, she served alongside Vogue’s Anna Wintour as co-chair of theMetropolitan Museum‘s Costume Institute gala, while the stage door she donated to the Museum of Broadcast Communications in Chicago is currently on view through July 15. From her own, deeply personal donation to a Wisconsin museum to a West Village gallery show memorializing her late dogs, Oprah’s adventures with art are best described as eclectic. 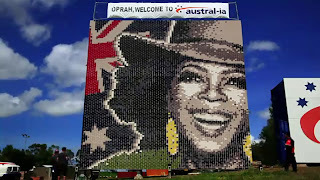 To honor Oprah’s final show, ARTINFO has compiled a list of the top five moments in Oprah-inspired art, from the positively uplifting to the downright creepy. Martin Luther King Was White?